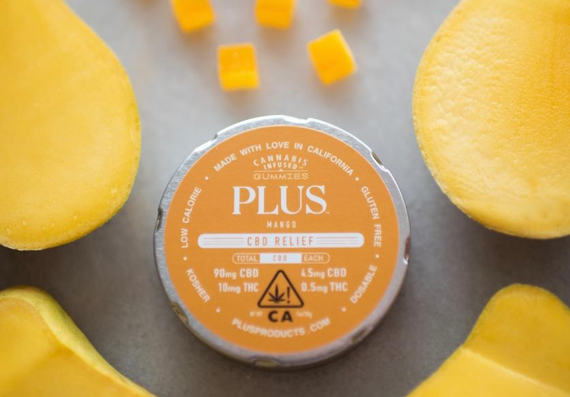 San Mateo, CA – April 4, 2019 – Plus Products Inc. (CSE: PLUS) (OTCQB: PLPRF) (the “Company” or “PLUS”) today announced the launch of its newest product: “Mango CBD Relief,” which will contain 4.5MG of CBD and .5MG of THC in each gummy. The new product is already available at some of the more than 250 retailers in California who carry the PLUS product line. The Company will retire its previous “CBD Relief” product, “Pineapple Coconut CBD Relief,” as part of a coordinated launch campaign with retailers. According to BDS Analytics, Pineapple Coconut CBD Relief was the top selling CBD edible in the California market in Q4 2018 as measured by units and dollars sold. PLUS regularly conducts customer research and takes the learnings back to its labs to enhance its products. Many PLUS customers indicate they feel greater therapeutic effects from using CBD when they pair it with a small amount of THC. The new CBD Relief formulation offers a deliberate, proprietary blend of cannabinoids, terpenes and flavonoids. Customers also inspire PLUS to create limited editions of its market-leading infused gummies. Most recently, popular demand drove the limited release of “Pink Lemonade Refresh” this spring and “Cranberry Shortbread Bliss” for the holiday season. PLUS Products creates safe and delicious cannabis food products. PLUS’s mission is to make cannabis safe and approachable - that starts with high-quality products that deliver consistent experiences. The gummies are manufactured at PLUS’s own factory in Adelanto, CA, where dosage is tested twice internally and then tested twice again by an independent lab. PLUS is headquartered in San Mateo, CA with 60 employees. Forward-looking information involves known and unknown risks, uncertainties and other factors that may cause the actual results, performance or achievements of the Company to differ materially from any future results, performance or achievements expressed or implied by the forward-looking information. Accordingly, readers should not place undue reliance on any such forward-looking information. Further, any forward-looking statement speaks only as of the date on which such statement is made. New factors emerge from time to time, and it is not possible for the Company's management to predict all of such factors and to assess in advance the impact of each such factor on the Company's business or the extent to which any factor, or combination of factors, may cause actual results to differ materially from those contained in any forward-looking statements. The Company does not undertake any obligation to update any forward-looking information to reflect information, events, results, circumstances or otherwise after the date hereof or to reflect the occurrence of unanticipated events, except as required by law including securities laws.